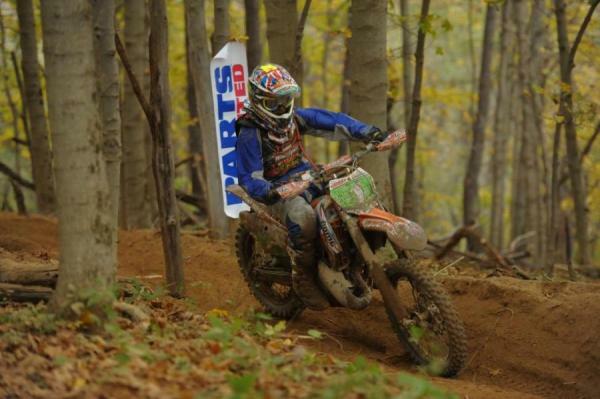 ST. CLAIRSVILLE, Ohio - Over 1,400 riders were on hand in St. Clairsville, Ohio on Sunday for the penultimate round of the 2013 AMSOIL Grand National Cross Country Series. After 12 rounds, several class championships in the Youth and Amateur divisions have been decided but the chase for the XC1 and XC2 titles remain up for grabs. At the 12th running of the ITP Powerline Park GNCC, Charlie Mullins captured a big overall win to put an end to Kailub Russell's previous five-race winning streak and tighten up the championship spread to just two points with one round to go. Defending XC2 Pro Lites champ Jason Thomas kept his championship hopes alive with a third place finish in the class where he will now face points leader Grant Baylor head-to-head at the season finale. Coming into the ITP Powerline Park GNCC, Russell held a seven-point lead over his Factory FMF/KTM teammate, but this time it was Mullins who prevailed after three hours of grueling battle in the rough and fast-paced 12-mile course. AmPro Yamaha's Paul Whibley claimed the early lead after grabbing the $250 All Balls Racing Holeshot Award but the KTM duo of Mullins and Russell were close behind as they made their way into the woods on the opening lap. Whibley captured the $250 All Balls Racing XC1 Holeshot Award. The XC1 Pro Class saw a few additional names along the front line at Round 12, including the return of defending XC1 Champion Paul Whibley, who missed the last two rounds due to injury and Factory FMF/KTM's Steward Baylor, who made his XC1 Pro Class debut after recovering from an ongoing injury. Sweden's Robert Kvarnstrom made his GNCC debut at Powerline Park, immediately putting himself inside the top five in the early part of the race. The Factory Beta rider jumped in behind Russell and Mullins in the fourth place position on the opening lap, followed closely by Shenandoah Honda/USWE-Sports.com's Thad DuVall, Nytro Handguards/B.R.E KTM's Chris Bach and Steward Baylor. By Lap 2, Mullins had made his way out front but Whibley continued to hold a strong second place position despite a hard charge by Russell around the halfway point. Russell caught and passed Whibley before the 2-Lap card fell, where he attempted to set his sights on the leader Mullins. In the meantime, Whibley didn't let up as the "Axe Man" kept the points leader in sight during the final laps of the three-hour race. Whibley commented after the race, "It was almost easier to ride because my injuries have healed up." Russell made a valiant charge but it wasn't enough to stop Mullins this round. In addition to the highly anticipated championship battle up front, the race for the fourth place position began to heat up around the halfway point as AmPro Yamaha's Jordan Ashburn, Rocky Mountain ATV/MC's Josh Strang and Chris Bach engaged in a wheel-to-wheel battle. Ashburn held off a hungry Strang for a majority of the race but as the 2-Lap card fell, the 2010 XC1 Champion made his move to claim the fourth place position, while Ashburn and Bach continued to chase him down in the final laps. Strang turned it up at the end of the three-hour race, finishing 4th for the day. DuVall and FMF/RPM/KTM's Rory Mead were poised to do battle inside the top five as well, but both riders experienced issues that held them back. DuVall ran into mechanical issues on Lap 2 where he was forced to sit in the woods for a substantial amount of time in order to wait for his pit crew to fix his bike. While DuVall was eventually able to return to action, the West Virginia native lost enough time to put him a lap down from the rest of the field. Mead got up to the fifth place position on Lap 2 but the New Zealand native quickly lost time after going over the bars in the infamous Powerline mud hole. As quickly as Russell gained time on Whibley to make the pass for second, the current points leader then lost it as Mullins slowly extended his lead during the final moments of the six-lap race. In the end, Mullins came through the finish with over one and a half minutes on his teammate Russell where he secured his fifth overall win of the season at the penultimate round. "It feels like I've sort of been on a dry spell, so it feels good to get a win," Mullins said. "It's all about the championship from here and the math is pretty easy, I just have to beat Kailub at the last round. It's going to be a high-pressure situation but I'm up for it." Mullins' overall victory brought him to within two points of the National Championship. Russell now sits only two points ahead of Mullins in the National Championship standings and the duo will compete head-to-head for the 2013 crown at the Ironman finale in two weeks. "I'm pretty bummed but we still got a shot at it [the championship]. It's winner take all, just like last year, and I know the agony of defeat and how bad I felt last year so I'm going to do everything in my power to take the championship home." Whibley (1) led the early parts of the race before Mullins (112) took over. Whibley put forth an impressive ride in his first race back from injury to claim third overall, finishing just seven seconds behind Russell. "I was pretty excited to be back after three months away and some surgery, so to be back mixing it up with Charlie and Kailub right away, I felt pretty good," Whibley said. XC1 podum: (left) Kailub Russell, Charlie Mullins, (right) Paul Whibley. Strang was able to hold off the rest of the pack to earn a fourth place finish for the day, followed closely by Ashburn in fifth and Bach in sixth. Mead was able to recover from his fall in the mud hole, where he captured seventh place for the day, followed by Japan National Cross Country Champion Takeshi Koikeda in eighth, AmPro Yamaha's Ricky Russell in ninth and Adam Bonneur rounded out the Top 10 in XC1. The XC2 Pro Lites championship tightened up a little more on Sunday as DirtWise Schools/KTM-Parts.com/Maxxis rider Jason Thomas gained seven points on class leader Grant Baylor after the day's racing. Thomas got off to a fifth place start where he quickly made his way through the pack and into the third place position by Lap 2. It was Shane Hufford Jr. who claimed the early lead after grabbing the $100 DigitalOffroad.com Holeshot Award, followed by F.A.R Husqvarna's Andrew Delong and Thomas early on. 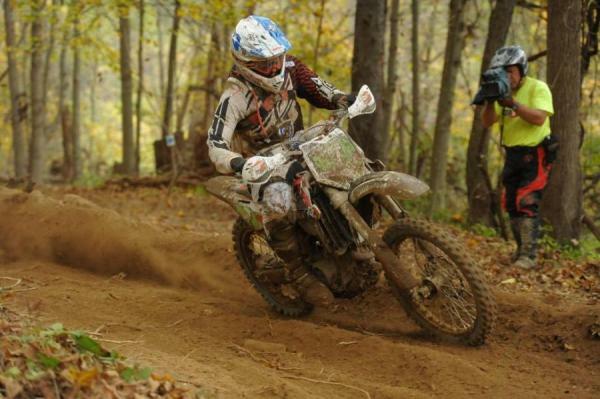 Andrew Delong makes it three-in-a-row for XC2 Class victories. Delong made his way into the lead by Lap 2 and the Pennsylvania native never looked back, leading five of the six laps of the race. Hufford dropped into the second place position but the Pennsylvania kept the pace going for the remainder of the race. Thomas worked hard to close the gap on Hufford in the second place position but after three hours of racing, Thomas finished 37 seconds back to claim third. Hufford held strong to lock in the second place spot, nearly two and a half minutes behind Delong, who captured his third straight win in the XC2 Class. "I'm really happy to finally get a win here at Powerline Park. I usually don't have good luck here but for some reason everything seemed to click today and it was like a flawless day," Delong said. Jason Thomas kept his championship hopes alive with a 3rd place finish in XC2. KTM Support rider Grant Baylor came off the start just inside the Top 10 and from there it was a struggle to get to the front of the pack. 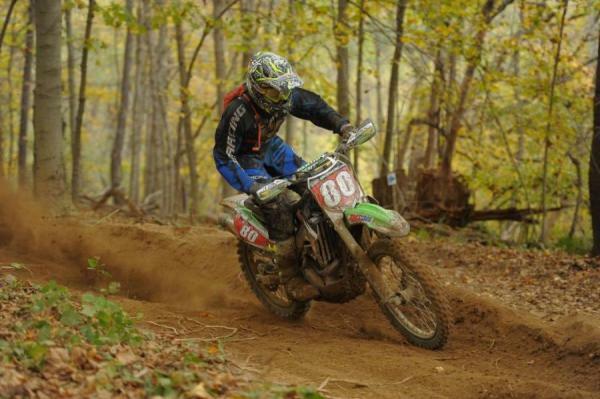 On Lap 2, the current XC2 Pro Lites points leader ran out of gas and lost substantial time getting back on track. From there, Baylor worked his way to a seventh place finish for the day. Baylor holds a 21-point lead over Thomas heading into the final round of racing. 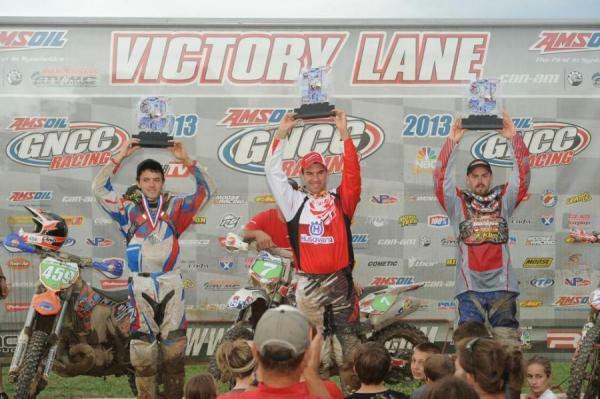 XC2 podium: (left) Shane Hufford Jr, Andrew Delong, (right) Jason Thomas. Ohio's Scott Grills put forth another solid finish to capture fourth overall and West Virginia's Layne Michael rounded out the top five overall after making a big switch to the Honda 250F for the final two rounds of the season. Indiana's Mike Witkowski finished 23rd Overall to claim Top Amateur honors. 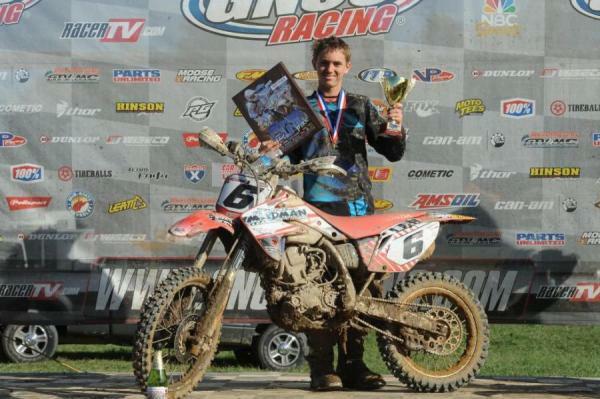 In a heated battle for the 250 A Class win, Indiana's Mike Witkowski topped runner-up Anthony Stone by only six seconds in the final moments of racing. Witkowski's 23rd overall was enough to earn him his first career Top Amateur Award, while Stone came in 24th overall for the day. Women's Class podium: (left) Jessica Patterson, Maria Forsberg, (right) Kacy Martinez. 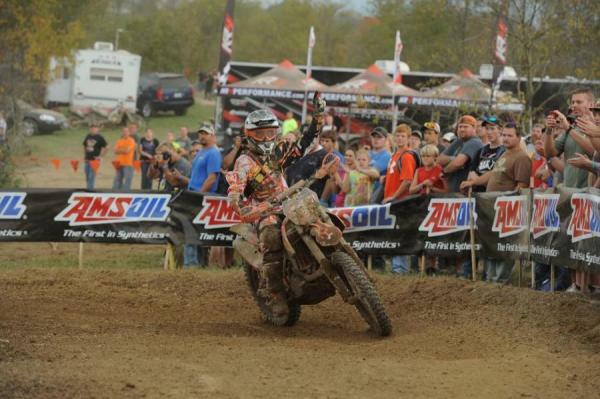 After two hours of battle, Factory FMF/KTM's Maria Forsberg captured the AM Overall victory at the ITP Powerline Park GNCC. 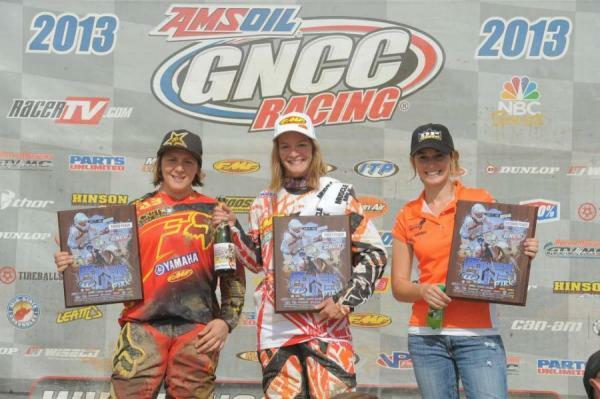 In addition to the overall win, Forsberg bested FMF/RPM/KTM's Kacy Martinez by less than one minute to capture her eighth win in the Women's Class, clinching the 2013 Women's Class National Championship with one round to go this season. South Carolina's Vance Earl captured the Master's A (50+) Class win, taking home the third and final position atop the overall podium. N-FAB/AmPro Yamaha's Jessica Patterson put forth a solid performance to capture third place in the Women's Class and 20th overall for the day. Braxton McGee claimed the Youth Overall win at Powerline Park. North Carolina's Braxton McGee topped the Youth Overall podium once again, finishing just ahead of second place finisher Sam Thurman in the overall ranking as well as the Super Mini (14-15) Class. North Carolina's Conner Smith grabbed the Super Mini (12-13) Class win en route to a third place overall finish in Ohio. 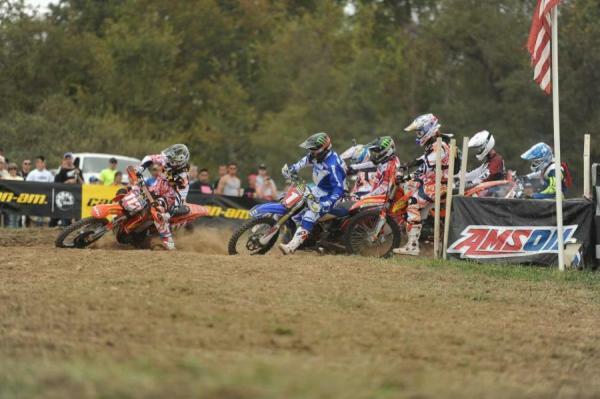 The 2013 AMSOIL Grand National Cross Country Series heads to Crawfordsville, Ind. 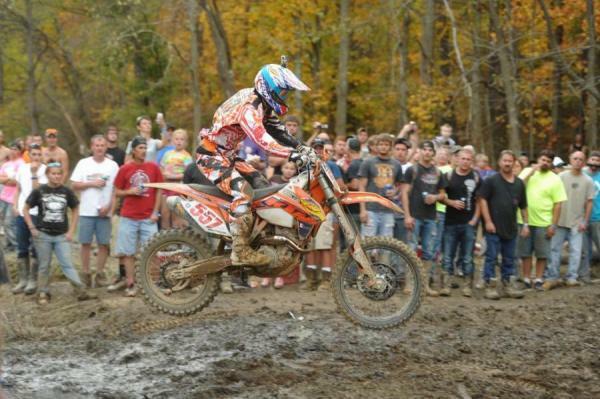 on October 26 and 27 for the AMSOIL Ironman GNCC. 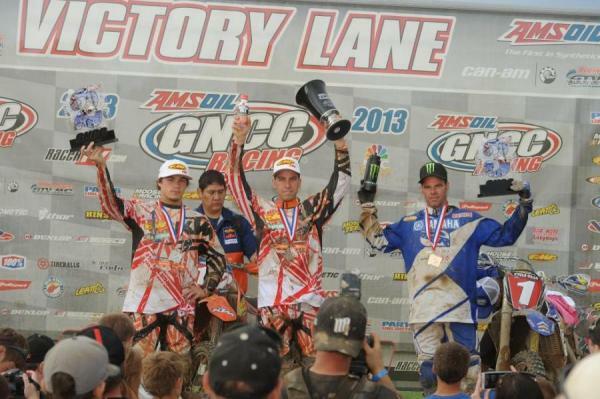 For more information on the series, please visitwww.gnccracing.com. Top Photo: Ken Hill Whibley captured the $250 All Balls Racing XC1 Holeshot Award. *Indicates that the Overall National Championship Standings will determine the 2013 National Champion.